1Neurosurgical Institute, University of Ioannina, 45500 Ioannina, Greece. 2Department of Radiology, University Hospital of Ioannina, 45500 Ioannina, Greece. 3Department of Pathology, University Hospital of Ioannina, 45500 Ioannina, Greece. 4Department of Nuclear Medicine, University Hospital of Ioannina, 45500 Ioannina, Greece. 5Department of Neurology, University Hospital of Ioannina, 45500 Ioannina, Greece. Dr. Chrissa Sioka, M.D., D.Sci., received her M.D. in 1998 from the University of Sofia Medical School in Sofia, Bulgaria, and her D.Sci. from the University of Ioannina, Greece. She finished her Nuclear Medicine Residency in 2007. 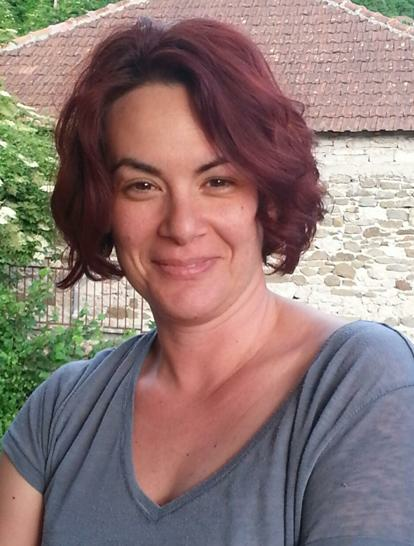 Her research is focusing on imaging techniques using single photon emission computed tomography and positron emission tomography. The standard treatment of glioblastoma, the most common type of primary-brain-tumor, involves radiotherapy with concomitant temozolomide chemotherapy. A patient with glioblastoma, post radiotherapy developed magnatic resonance imaging (MRI) changes consistent with either radiation-induced tumor necrosis or tumor recurrence. 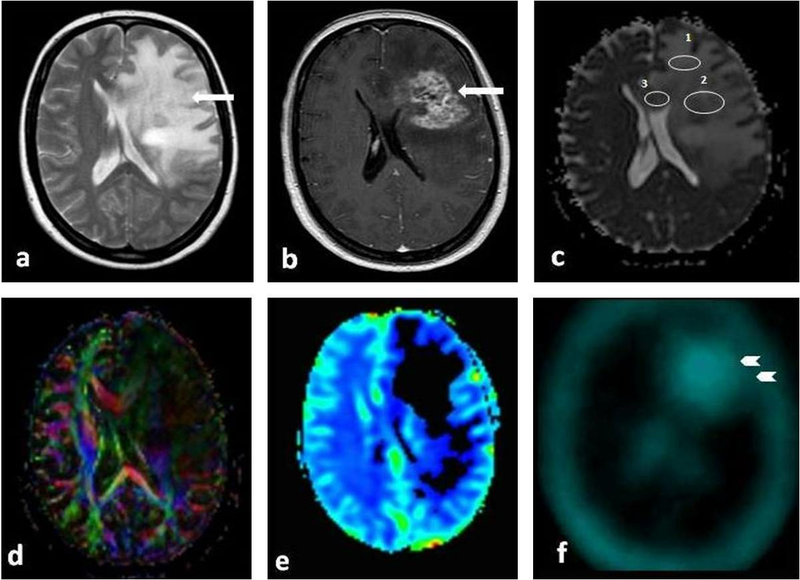 Perfusion MRI was suggestive of radiation necrosis, but magnetic resonance spectroscopy and 99mTc-Tetrofosmin single photon emission computed tomography was indicative of tumor recurrence. Positron emission tomography scan was not available. Tumor recurrence was documented by biopsy. Several advanced imaging methods are available to differentiate tumor recurrence from radiation necrosis in glioblastoma patients. However, in inconclusive cases, brain biopsy should be performed for definite diagnosis. Glioblastoma multiforme (GBM) is the most frequent primary-brain-tumor in adults. Its profound cellular heterogeneity, presence of stem cells and highly invasive characteristics renders this tumor difficult to treat, exhibiting high recurrence rates and poor survival. The initial therapeutic intervention involves maximal surgical resection, if the tumor is surgically accessible, otherwise a needle biopsy, to document the diagnosis and determine the histologic grade, suffices. The mainstay of post-surgical therapy involves conventional radiotherapy, with an approximate total radiation dose of 5,500 to 6,000 rads over 6 weeks period, and with concomitant temozolomide chemotherapy. Further chemotherapy with temozolomide may be given for approximately 1 year thereafter. In any step during post radiotherapy follow-up, change of any imaging characteristic requires differentiation between tumor progression, requiring therapy change, and radiation-induced necrosis, requiring mostly symptomatic therapy. In the present case the above question was raised in a young patient requiring a large number of diagnostic tests to be performed, which produced conflicted results requiring partial tumor resection for the correct diagnosis. A 35 years old woman was diagnosed with a left-frontal astrocytoma, grade II, 5 years prior to admission to our hospital, during which time it was partially resected without further treatment. Two years prior to admission, she had a recurrence, and a new resection revealed progression to glioblastoma multiforme (grade IV). She underwent standard radiotherapy (6,000 rads) with concomitant temozolomide therapy, followed by 1 year of 5 days per month temozolomide chemotherapy. Subsequently, she remained stable on no further therapy until 1 year later when she developed progressive right hemiparesis, expressive aphasia and seizures. At that time, an MRI was performed demonstrating, in the T2-W axial images [Figure 1a] and T1-W axial images with intravenous contrast administration [Figure 1b], a mass lesion consistent with either tumor recurrence or radiation necrosis. Diffusion weighted imaging (DWI) [Figure 1c] showed restricted diffusion consistent with malignant tumor infiltration. However, the fractional anisotropy (FA) [Figure 1d] maps and the perfusion maps (CBV) [Figure 1e] were consistent with radiation-induced necrosis. Subsequently, a 99mTc-Tetrofosmin single photon emission computed tomography (SPECT) was performed [Figure 1f], which revealed increased metabolic activity, indicative of tumor recurrence. Magnetic resonance (MR) spectroscopy demonstrated decreased N-acetylaspartate (NAA) and increased choline (Cho) with ratio Cho/NAA > 3.63, compatible with infiltration of malignant cells with high metabolic activity (not shown). Positron emission tomography (PET) scan was not available atour institution. Due to discrepancy between the imaging tests, a partial surgical resection was performed for accurate diagnosis. Histological examination showed evidence of tumor recurrence in most of the resected tissue [Figure 2a and 2b]. There were some small parts of the tumor exhibiting radiation-induced changes as well [Figure 2c]. The high proliferation rate of the tumor cells denoted an aggressive tumor [Figure 2d]. The patient was started on daily low dose temozolomide (50 mg/m2 of body surface per os) administration and oral dexamethasone at 6 mg/day, and she remained alive and stable 6 months after the operation. After the standard initial therapy, consisting of a combination of radiotherapy with temozolomide chemotherapy followed by plain temozolomide therapy, glioblastoma multiforme usually recurs within the first year from therapy. However, at that point it may be difficult to differentiate between radiation necrosis of the tumor vs. tumor recurrence, since both conditions behave similarly on traditional imaging modalities (Standard CT or MRI with and without IV contrast administration). In these cases, more advanced imaging modalities can be employed to differentiate between tumor recurrence from radiation necrosis, such as PET and perfusion/diffusion MRI. However, in many countries, PET is not widely available, necessitating the use of other nuclear medicine modalities such as SPECT with various tracers. MR spectroscopy is another alternative imaging method to improve our diagnostic capabilities in brain tumor evaluation, however, this modality is still not widely available. NAA is an acetylated amino acidconcentrated in neurons that functions as a neuronal marker. Any destruction of neurons, such as noted by high grade malignant tumors or radiation-induced necrosis, decreases the amount of NAA and thus reduces its peak in MR spectroscopy. Choline (Cho) is an essential nutrient that, in addition to being a precursor in acetylcholine synthesis, is a basic component of sphingomyelin and phosphatidylcholine, both constituents of cell membranes. During MR spectroscopy, Increased Cho indicates higher cellularity, as seen in tumors, and decreased Cho indicates radiation-induced necrosis. In general, an increased ratio of Cho/NAA is indicative of brain tumor growth. In our patients, a Cho/NAA > 3.63 was considered a strong suggestion for tumor recurrence, rather than radiation necrosis. Partial resection of the tumor mass and histologic examination demonstrated the presence of recurrent tumor. However, in some areas of the mass, the occurrence of radiation-induced changes may at least partially explain the discrepancy between the various imaging modalities. 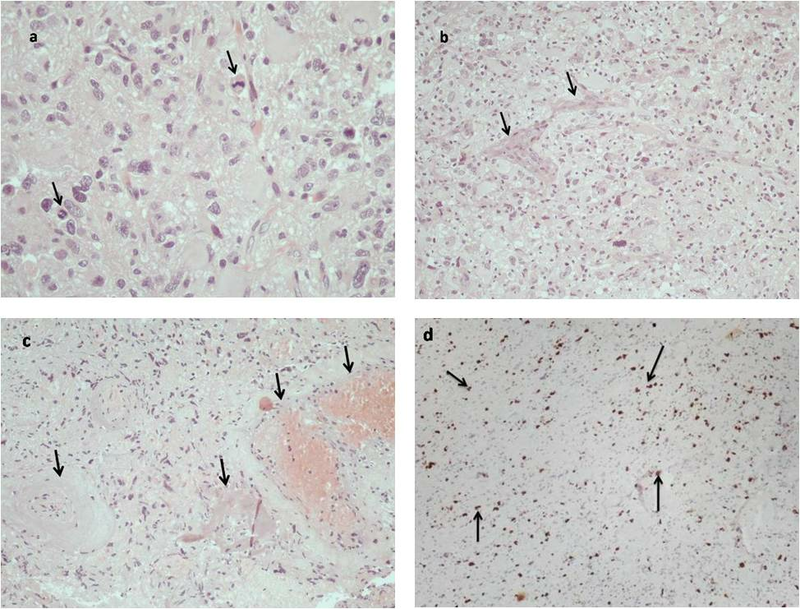 In conclusion, the differentiation of treatment induced necrosis from glioblastoma recurrence or progression is imperative in order to employ the appropriate treatment. Although it may be impossible to differentiate such a condition with conventional imaging, new technology, such as combination of diffusion/perfusion MRI, MR spectroscopy with either PET or SPECT, should be able to accurately diagnose the patient’s condition. In rare cases, such as in ours, biopsy may be needed if the imaging methods are contradictory. 1. Assimakopoulos A, Polyzoidis K, Kyritsis AP. Stem Cells in Gliomas. J Stem Cells Res, Rev Rep 2014;1:1009. 2. Kyritsis AP, Levin VA. An algorithm for chemotherapy treatment of recurrent glioma patients after temozolomide failure in the general oncology setting. Cancer Chemother Pharmacol 2011;67:971-83. 3. Stupp R, Mason WP, van den Bent MJ, Weller M, Fisher B, Taphoorn MJ, Belanger K, Brandes AA, Marosi C, Bogdahn U, Curschmann J, Janzer RC, Ludwin SK, Gorlia T, Allgeier A, Lacombe D, Cairncross JG, Eisenhauer E, Mirimanoff RO; European Organisation for Research and Treatment of Cancer Brain Tumor and Radiotherapy Groups. Radiotherapy plus concomitant and adjuvant temozolomide for glioblastoma. N Engl J Med 2000;352:987-96. 4. Nasseri M, Gahramanov S, Netto JP, Fu R, Muldoon LL, Varallyay C, Hamilton BE, Neuwelt EA. Evaluation of pseudoprogression in patients with glioblastoma multiforme using dynamic magnetic resonance imaging with ferumoxytol calls rano criteria into question. Neuro Oncol 2014;16:1146-54. 5. Soffietti R, Leoncini B, Ruda R. New developments in the treatment of malignant gliomas. Expert Rev Neurother 2007;7:1313-26. 6. Alexiou GA, Tsiouris S, Voulgaris S, Kyritsis AP, Fotopoulos AD. Glioblastoma multiforme imaging: the role of nuclear medicine. Curr Radiopharm 2012;5:308-13. 7. Assimakopoulos A, Polyzoidis KS, Sioka C. Positron emission tomography imaging in gliomas. Neuroimmunol Neuroinflammation 2014;1:107-14. 8. Alexiou GA, Zikou A, Tsiouris S, Goussia A, Kosta P, Papadopoulos A, Voulgaris S, Tsekeris P, Kyritsis AP, Fotopoulos AD, Argyropoulou MI. Comparison of diffusion tensor, dynamic susceptibility contrast mri and (99m)tc-tetrofosmin brain spect for the detection of recurrent high-grade glioma. Magn Reson Imaging 2014;32:854-9. 9. Alexiou GA, Tsiouris S, Goussia A, Papadopoulos A, Kyritsis AP, Polyzoidis KS, Fotopoulos AD. Evaluation of glioma proliferation by 99mTc-Tetrofosmin. Neuro Oncol 2008;10:104-5. 10. Zhang H, Ma L, Wang Q, Zheng X, Wu C, Xu BN. Role of magnetic resonance spectroscopy for the differentiation of recurrent glioma from radiation necrosis: a systematic review and meta-analysis. Eur J Radiol 2014;83:2181-9.